She was a young, very young, female all alone in the rugged Black Hills. The poor little orphan could not take care of herself and she had nothing to her name. As if all this wasn’t bad enough, there was also a bounty on her head. No, I’m not talking about some vixen outlaw or some wayward soiled dove or even a cast off urchin. I’m referring to Tootsie, the small coyote pup that Ollie Wiswell stumbled upon one spring day in 1947. Probably the last thing Wiswell was expecting to see, or wanted to see, while leisurely exploring in the Custer Peak area was an orphaned coyote pup. His surprise discovery turned out to be Tootsie’s lifesaving ticket to fame and good fortune. 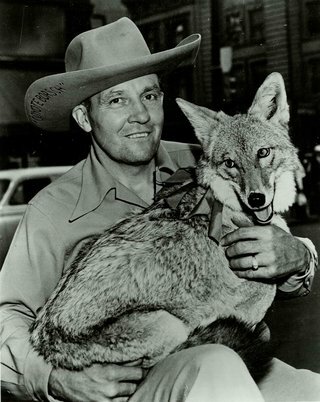 In 1947, and other years, there was a bounty on coyotes. The State of South Dakota considered them to be a predatory animal and a threat to livestock. As attractive as the bounty money may have been, Ollie was too softhearted to take the necessary action to collect. He gave the adorable little pup to Fred and Esther Borsch, who named her Tootsie. 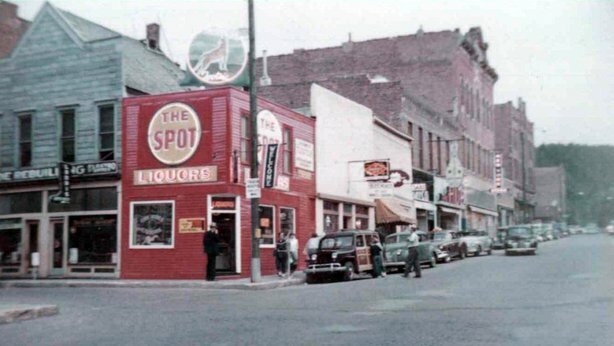 The Borsch’s lived in Galena and owned the Spot Liquor store, located on the corner of Main and Lee Streets in Deadwood. Fred and Esther Borsch’s Spot Liquor store on the corner of Main and Lee Streets in Deadwood. A sign featuring Tootsie sits atop the building. Date: 1950s. Photo courtesy Deadwood History, Inc., Adams Museum Collection. Fred and Esther soon found out that coyotes are quite vocal animals, one of the most vocal in North America, in fact. 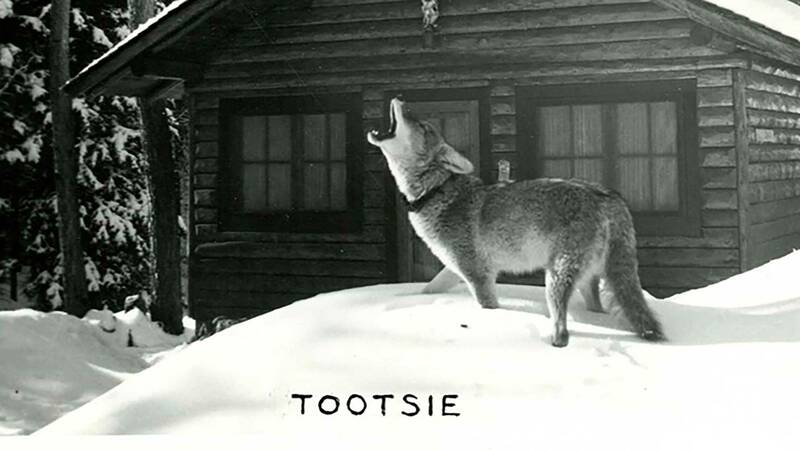 Fred encouraged Tootsie’s howling proclivity, so much so that he began to sing along to her howls. With a bit of practice and some gentle persuasion, it was not long before Tootsie could change the pitch of her howl to match that of Fred’s singing. The singing duo even cut a record titled South Dakota Tootsie. Fred Borsch and Tootsie pose for a publicity photo promoting one of their recordings. Date: unknown. Photo courtesy Deadwood History, Inc., Adams Museum Collection. Tootsie was a regular at the Borsch’s Spot Liquor store. She could be found hanging around the place on any ordinary day and often gave unsuspecting customers quite a startle. An attractive and colorful sign, featuring Tootsie, stood as a sentinel on the store’s roof for years. She and Fred frequently appeared in the Days of ’76 parades, other parades in the area, and special events. She was such an appealing, talented, and unusual animal that she gained popularity with people all across the state of South Dakota. 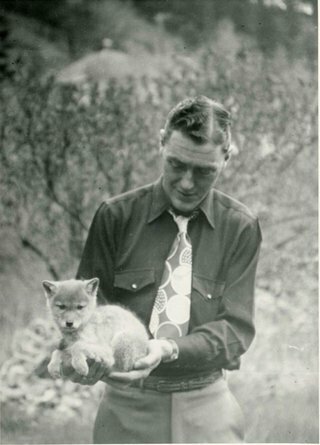 As testament to this, Governor George T. Mickelson proclaimed the coyote the state animal in 1949. Tootsie on top of display counter at Spot Liquor store. Photo courtesy Deadwood History, Inc., Adams Museum Collection. Tootsie and Fred Borsch appearing in the Days of '76 Parade. Date: 1950. Photo courtesy Deadwood History, Inc., Adams Museum Collection. 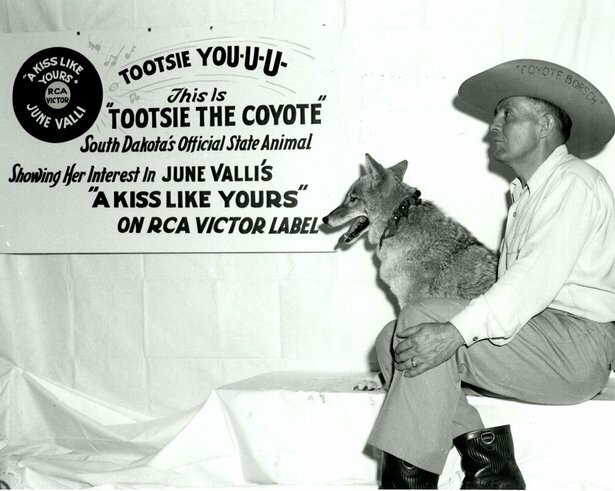 Fred Borsch with Tootsie, South Dakota’s official state animal. Date: 1949. Photo courtesy Deadwood History, Inc., Adams Museum Collection. Eventually her popularity grew beyond the confines of Deadwood. This coyote, who came from humble and uncertain beginnings, was now rubbing elbows or haunches perhaps, with political dignitaries. Fred took Tootsie on a ten-state tour that included a stop at the White House, where, it was said, President Eisenhower and Vice President Nixon were captivated by her. 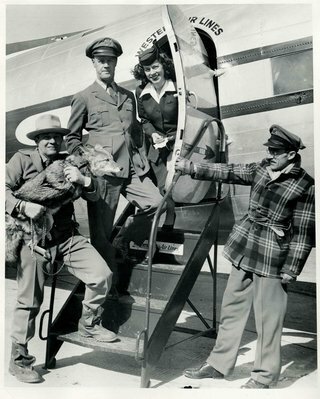 Tootsie promoting the new Western Airlines Spearfish to Rapid City route. Date: 1958. Photo courtesy Deadwood History, Inc., Adams Museum Collection. Sadly, Tootsie passed away in 1959 following surgery to remove a tumor. She was buried behind the Borsch’s cabin in Galena. 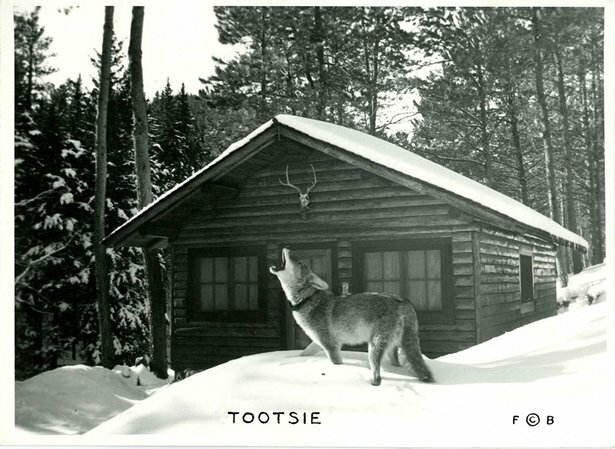 Tootsie howling in front of her owner’s cabin in Galena. Date: unknown. Photo courtesy Deadwood History, Inc., Adams Museum Collection. Her Deadwood legacy, however, remains alive today thanks to the efforts of two unique projects. The original sign that featured Tootsie, and was such a landmark element for years on Main Street, was recently restored with funding from the Deadwood Historic Preservation Commission. The familiar sign once again stands on the roof of the building that was once home to the Spot Liquor store. Tootsie t-shirts on sale at the Adams Museum. 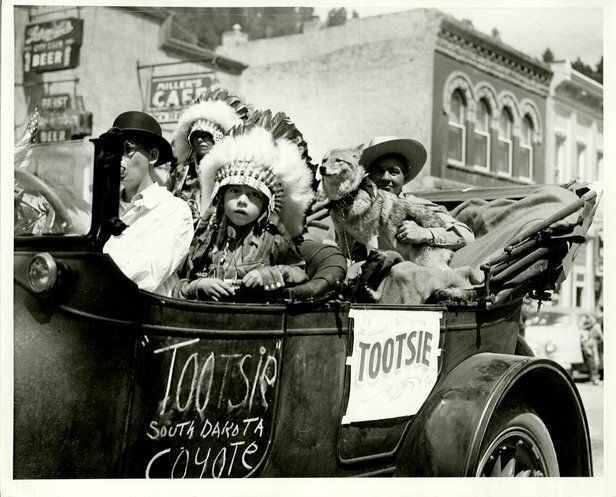 Photo courtesy Deadwood History, Inc., Adams Museum Collection. 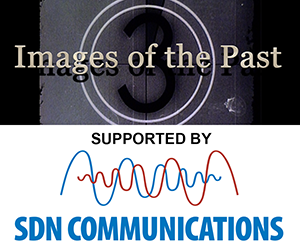 The second project allows everyone to have a little piece of this great Deadwood story for their own. Chelsie Bauer, Deadwood History’s media art designer, created an attractive t-shirt design based on the recently restored Tootsie sign. 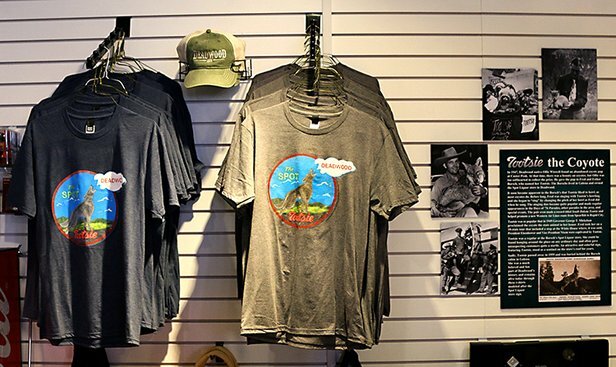 The t-shirts are for sale at the Adams Museum in Deadwood. In addition, a small display with information and photographs that tell this charming story are in place. The t-shirts are a fun way to celebrate Tootsie and Deadwood.